Rock’s first vocal group and the influential trendsetters for the next twenty or more years of group harmony vocals, as well as the first rock artists of any type to score an authentic hit on the Billboard charts, one of eleven they notched in a five year stretch at the dawn of rock ‘n’ roll. The Ravens formed after World War Two in New York with leader Jimmy Ricks, the greatest bass singer in rock history. 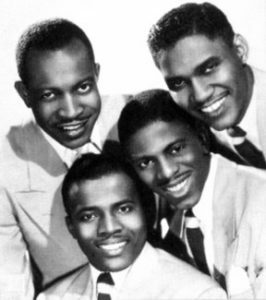 Whereas most groups, then and since, have a tenor lead with the bass singer only occasionally stepping outside of the group harmony bed, The Ravens – inspired in part by the pre-rock outfit The Delta Rhythm Boys with their profundo bass Lee Gaines – utilized Ricks warm, cavernous voice as their centerpiece and calling card. Signed by talent agent Ben Bart whose Hub Records issued their first sides in 1946 which were largely unclassifiable to the standards of the era. Though the label didn’t have the power to promote them nationally they were very popular in New York and by December of that year they’d added Maithe Marshall whose high tenor would contrast well with Ricks’s unearthly bass, giving them another wrinkle to their signature sound. By the spring of 1947 the foursome, also featuring Leonard “Zeke” Puzey and Warren Suttles, signed with the larger National Records cutting a revolutionary version of “Ol Man River” which defined their approach with Ricks bass sounding lecherous even singing something non-threatening while the others provided exquisite harmony. When rock took hold in September they wasted no time in joining in since that was the style they were already leaning towards before it even existed and were clearly most at home in, bringing immeasurable soulfulness to everything they sung. Their first hits followed in rapid succession, forever altering the way vocal groups performed, even through numerous personnel changes but always anchored by the resonant bass voice of “Ricky”. Over time they jumped from label to label, their popularity within their core audience keeping them commercially viable for years even with numerous defections among their members. Eventually an entirely new group of singers surrounded Ricks whose presence still ensured they had the distinctive sound that made them famous. When he finally left for an unsuccessful solo career in the mid-1950’s others carried on the Ravens name, but by this time the rock ‘n’ roll skies were full of “bird-groups” many of whom had chosen their names as an homage to the group that started it all.